Chic Alert: Whisper in His Ear! 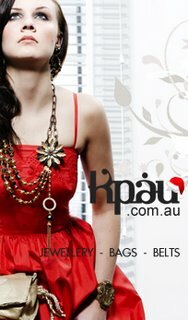 Fast becomming a favourite when shopping for hot fashion accessories is Kpau. You can always be certain to find something you'll love from this online boutique's impressive range from internatonal designers, Blush B Lush, Damselfly, Erana & Daska, Estilo, Foxes, Ghost & Lola, Isabella, Jan Michaels, Junkie 3, Linea Pelle, Lisa Marinucci, Madame Mooi, Miel, Oraniazana, Pratten, Samantha Wills, Sarah Conners, Smena, Sophie Kyron, Soulskin, Steven Shein and Zare Designs. Kpau search the globe to bring you the best in international fashion and I often browse through their huge range of New Arrivals like today's fabulous bags from Toast and Miel. My pick: Oh it's so hard to choose when you shop at Kpau...lol. However, I think a stylish bag from Pratten, Isabella or Estilo will make you very happy! Or perhaps a piece from the beautiful jewelry range from Samantha Wills, or Damselfly or Erana & Daska. And do make sure you check out the cute necklaces from Steven Shein. Fashionistas! Whisper Kpau in his ear, and get your man to click into Kpau for that standout gift. If he resists then just remind him about Kpau's special offer of 20% OFF their entire range for Christmas only!